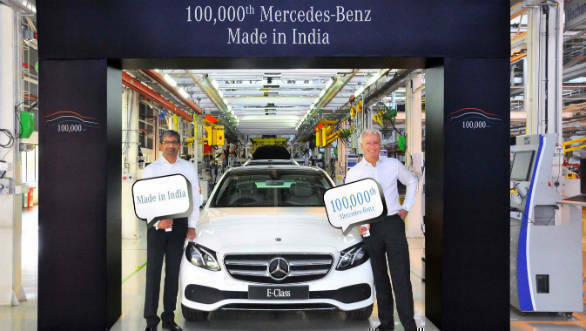 Mercedes-Benz has passed an important milestone for its operations in India by rolling out 100,000 cars from its plant in Chakan, Pune. The company has been present in the country since 1994 when it started by assembling the W 124 generation E-Class in the country, the first luxury carmaker to do so. Coincidentally, the 100,00th car is also a present gen LWB E-Class. The company has completed a number of achievements along the way. It rolled out its 20,000th car in 2008, the 30,000th car in 2010. Then in 2014, the company crossed the 50,000th car production milestone. The sudden surge in sales 2008 is when new entrants like BMW and Audi arrived in India. This increased competitiveness leading to varied, affordable models from all three brands. This also coincided with when younger, more informed buyers started having the means to access these luxury cars. With this success, Mercedes-Benz India moved the facility to Chakan near Pune with an investment of INR 1000+ crores. The facility is spread over 100 acres and is part of Mercedes-Benz's global production network. Mercedes-Benz India plays an important role in the CKD/MVP production network in Brazil, Indonesia, Malaysia, Thailand and Vietnam. This is supported by a large spare parts warehouse which holds more than 44,000 parts.